CHOOSE A BRAND BELOW TO SEE HOUSE SHUTTER STYLES, PRICING AND INFORMATION! Maintenance Free Exterior Shutters For Your Home! Mid-America Standard & Custom Size Shutters! Choose from these Standard Size Shutters for the best prices! Choose Custom Size Exterior Shutters for the most styles! Affordable and backed by a Lifetime limited Warranty! Custom and Standard sizes available for the most options and styles. Backed by a limited Lifetime Warranty. Peace of mind that products won't crack, split, or fade. Durable polypropylene co-polymer vinyl, maintenance-free U.V. stabilized, wood grain texture. Performance. Solid-Thru color products hold up in all weather conditions and all climates. Maintenance-free. No scraping, sanding or painting needed. Made in the USA. Mid-America Siding Components products are engineered and manufactured to exacting standards. 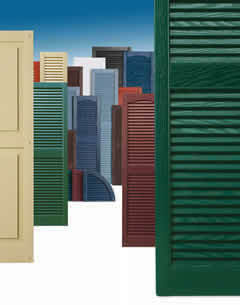 Girardin Polymer Vinyl One Piece Decorative Exterior Shutters! You asked for a vinyl/plastic shutter that is BETTER LOOKING and MORE FADE RESISTANT than the shutters available at the local big box home center . . . WE HAVE THEM! Girardin Polymer Constructed Shutters with UV Stabilized Bonded Acrylic surface withstands environmental extremes for long lasting beauty and the best fade resistance possible. Durable, Care-Free Shutters, In The Sizes, Colors And Styles You Want! Lifetime warranty Against defects in materials and construction. 7/8" thick. with hollow back design. Comes with aluminum square drive heads. Standard with pre-drilled mounting holes. Perfect Shutters Dura-Prene™ Decorative Vinyl Shutters! Our Most Complete Collection of Vinyl Shutter Sizes, Colors and Styles! Louvers, raised panels, classic panels, shaker panels and framed board-n-batten style vinyl shutters available. NEW - 15" wide Standard Size Raised Panel and Louver shutters. NEW! 15" wide Premier standard size shutters. Full line of custom vinyl shutter sizes and styles. Limited Lifetime Warranty - Full Product Replacement. Shutter are boxed and include, warranty, installation instructions. and your choice of mounting hardware: Screws or Shutter Spikes. Choices - louver shutters available with straight top or cathedral top detail. Wide variety of standard molded Dura Finish color-through colors. State of the art construction Dura-Prene™ with UV stabilizers. Choose custom for any length in (1/4" increments). Choose standard size shutters for the most affordable. Sold, priced and boxed in pairs (2 shutters). Homeowners have plenty of options to choose from when they look to the Mid-America Siding Components Shutters section of our online .pdf catalog. Larson Shutter Company offers different styles of exterior shutters in this brand of vinyl that have color through material and a limited lifetime warranty, as well as free shipping for the continental U.S. Anyone looking to find the perfect vinyl exterior window shutters, toppers or accessories can buy them all here and easily liven up their previously unadorned window. By searching through our different subcategory pages, you will find gable vents, window headers, shutter tops and other additional pieces. When it comes to the actual exterior decorative shutters themselves, you can order either standard or custom versions of the Louver, Raised Panel, and Board & Batten styles. This last style in particular can consist of two to five boards, joined or spaced, so they fit in with the house visually and architecturally. You will have freedom to pick which add-on options best work around the vinyl exterior window shutters and the windows they are attached to. These choices include sunburst shapes, vents or the flat headers that lend a stately feel to an exterior. Tops can match the Raised Panel or Louver style of the shutter, using an arch or standard box shape. To address the common concerns of installation, Larson Shutter Company includes your choice of fasteners to complete the installation process. You can also order a package of 2-inch, neutrally-colored ferrules to make exterior decorative shutters easier to mount on tough surfaces, cut to the desired length before they are shipped. 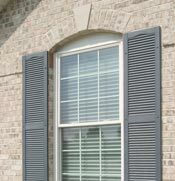 Mid-America Shutters are a recognized staple of home design, for your DIY project you should seek out the best vinyl exterior shutters for your house from a source that knows these products well. For more information, contact us through our website or call us at: 1-800-675-6555. You can also watch this video for information on the Mid-America Shutters product line. For raised panels, Board & Battens, and other types of decorative shutters, the Perfect Shutters Dura-Prene line offers a range of different options. Everything you should need to attach these vinyl exterior window shutters to your home comes with them in the box, such as the proper mounting pieces and a limited lifetime warranty. You will also receive these exterior decorative shutters boxed in pairs when you order, which makes them easier to handle and store. One of the key advantages of the Perfect Shutters Dura-Prene Decorative Shutters that Larson Shutter Company offers is the sheer variety available. Pieces vary in terms of width, length and style, encompassing all of the popular standard looks for vinyl exterior window shutters. You also have the option of several different color options. Each of the possible styles of exterior decorative shutters has its own separate page where you can read more. Another unique aspect of the Perfect Shutters Dura-Prene offerings is the Premier Standard Size sub-category. These products are well-crafted and have the appearance of authentic wood grain, but come with their own special discounts and dimensions. Home owners can choose from either a raised panel or open louver vinyl shutter in this size, with UV stabilizers and hollow-back construction. To make installation easy, we provide the fasteners with the shutters along with install instructions and there is a link on our website with the instructions also. 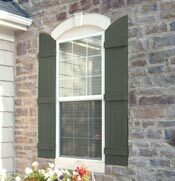 Using the details we've laid out for you, these vinyl exterior window shutters can be attached to siding made of brick, wood, aluminum or vinyl, with the appropriate screws and spikes, which we also provide. However in certain situations you may need anchors which are not included but are readily available at your nearest home supply center. It's important to follow these instructions when installing your new Dura-Prene Shutters to avoid damaging the walls. In addition, the Dura-Prene Shutters are compatible with the decorative S hooks and hinge sets in the accessories section. Because the Dura-Prene Perfect Shutters can be sold under different names at other online sites, it's important that you get the right exterior decorative shutters and aren't confused about what you are purchasing. Contact us by calling 1-800-675-6555 for more information. 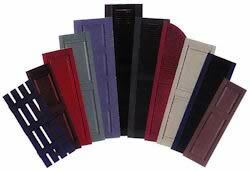 Why should you purchase Girardin Polymer Shutters for your home? These vinyl exterior window shutters are durable and designed to fit simply onto the mounting place with all of the necessary screws included and the mounting holes are per-punched in the shutters. More than that, they are temperature-resistant and can withstand a variety of weather conditions without losing any of their vibrant color, which come in 12 different distinct shades. Finding and ordering the right Girardin Polymer Shutters is easy through our website: You can choose the style and color of the vinyl exterior window shutters you want and receive them typically within 24 hours. There are two possible types of shutter available in this material, Louver and Raised Panel, and each one has a lifetime warranty. Polymer Louver Shutters come with straight or cathedral tops for whichever is most stylistic appropriate to your home however the 14" width louver style is the most affordable of the polymer vinyl choices. The straight top exterior decorative shutters range in width from 6 to 18 inches, while the cathedral style are between 10 and 18. They come in pairs, as well, so if you planning on fitting many windows with vinyl exterior window shutters can order one pair per window. The Polymer Raised Panel shutters are only available in two widths, 10 and 14 inches, but they have the same qualities and protections like the UV stabilization and a hollow back design. In addition to the exterior decorative shutters themselves, we also sell accessories to help emphasize them once they've been installed on the house, including special toppers matched to both types. The louver topper features the same grooves as the standard louvers, and the raised panel topper has an appropriate design that allows it to fit seamlessly over that shutter. Both of these toppers are for the 14 inch size shutters only. Other accessories include replacement screws, S-hooks, hinges and a screw-on slide bolt. Start browsing our selection today to learn more about each of these vinyl exterior window shutters and how to install them. You can learn more by calling us directly at 1-800-675-6555.